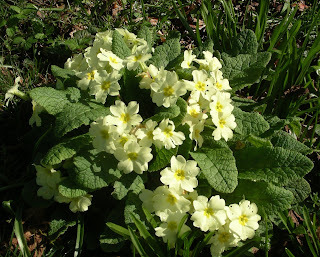 Time to plant primrose in your vegetable garden. Plant Cool Season Vegetables: Plant such vegetables as broccoli, peas, kale, beets, Brussel sprouts, cauliflower, lettuce, spinach, radish, carrots and celery. These plants will start producing in late winter or early spring. Plant onions and garlic too. Add Bulbs: Some bulbs can go into the ground now while others need at least six weeks of cold storage (in a paper bag in the refrigerator) before planting. Ask your local nursery what to buy and plant in your area. Bulbs will begin to grow and bloom in spring. If you don't want to go to the trouble of refrigerating bulbs, plant these varieties: amaryllis, calla lily, Dutch iris, freesia and watsonia. They can be left in the ground throughout the year. Reseed Lawn: It's time to address the bare spots in your lawn. First, loosen the soil, add a substantial layer of cool-season grass seed and then apply a compost top dressing. Water thoroughly daily until the seeds become 1-inch blades of grass. Divide Perennials: Perennials such as Shasta daisies, sage, lavender and yarrow need to be divided every few years. If you don't, they can turn brown and die in their middle. They will also produce fewer flowers. Divide during cool weather. Dig deep to pull out a clump of roots, separate the individual "crowns" or stalks and replant in soil containing flower planting mix. Agromin manufactures earth-friendly soil products for farmers, landscapers and gardeners. Agromin is also the composter for over 200 California cities. Agromin receives more than 50,000 tons of organic material each month and then uses a safe, natural and sustainable process to transform the material into soil products. The results are more vigorous and healthier plants and gardens, and on the conservation side, the opportunity to close the recycling circle, allow more room in landfills and reduce greenhouse gas emissions. Agromin is a U.S. Composting Council Composter of the Year recipient. www.agromin.com, Call 800-247-6646 to arrange product delivery from one of Agromin's compost or mixing/blending facilities located throughout California.